Grindelwald is based in the Bernese Oberland and lies embedded in the commanding mountains with the Eiger north face and the Wetterhorn. This backdrop and the numerous lookout points and activities make Grindelwald one of the most popular and cosmopolitan holiday and excursion destinations in Switzerland. It is also the home to the amazing Jungfraujoch, the highest railway in Europe. The cog railway takes you up to a height of 3,454m. It is now over 100years old and as well as being the highest is also the most fascinating train you’ll experience. GRINDELWALD is one of the OTP Premier Resorts, with our own experienced Resort Managers meeting you, taking you to your accommodation, handing you your ski passes & rental equipment and skiing with you if you would like to be shown the amazing ski area. In OTP Premier Resorts we offer hotels, self-catered accommodation and also an option of CATERED accommodation with 4+ persons. Grindelwald is also the largest base in the Jungfrau region, which includes Wengen and Mürren. It shares a ski area with Wengen, but also has its own ski area, famous for the accessibility of its glaciers and spectacular scenery. Long famed as a winter tourist destination with slopes for beginners and intermediates and the challenges of the Eiger glacier for the experienced, it is the usual starting point for ascents of the Eiger and the Wetterhorn. Grindelwald village is a classic Swiss mountain town. It is surrounded by authentic Alpine farms and chalets. All the hotels, little shops and restaurants line up along the main road, leaving all the smaller quaint and traditional chalets and hotels to spread up the hills to the north of the village. There is a free bus to help you around the village and to the lift station. The best places to go are just outside of the village to take in the amazing experience of the charming valley, while being surrounded by the original farms and outbuildings. Grindelwald has a great selection of restaurants. They are mostly hotel based, serving everything from Chinese, French, Italian, and Japanese all the way back to the Swiss Specialities. These range from informal and very good value with a village square boasting unpretentious and friendly restaurants to the top and 4 star hotels and restaurants. With so much going on in the evenings in Grindelwald, the action in the bars fails to dominate the resort's repu­tation. However there is plenty happening. Après-ski is excellent here, from quiet informal cafes to lively bars with music and rock bands. There are bars for every taste, night clubs are generally free entry and they and the main bars offer a number of theme nights as well. There are three ski regions that make up the entire area. The First, the Kleine Scheidegg – Männlichen and the Schilthorn – Mürren. They total around 215km of pistes with around 30 lifts reaching up to an altitude of nearly 3,000m. In the First area there is over 60km of prepared slopes and the White Elements snow park and the Super Pipe are very popular. There is a 30 limit ski slope to give the learners and escape from the speed freak. 40km of winter footpaths and tobogganing runs coupled with a magnificent panorama of the north faces of the Bernese Alps distinguish the Grindelwald-First region. First is reached by gondola from Grindelwald. 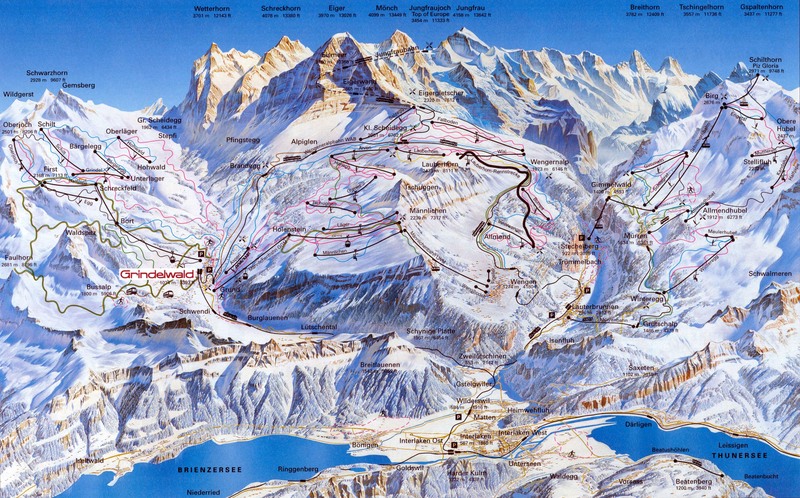 The ski region is reached by cog railway from both Grindelwald and Wengen or by cableway. At altitudes of between 1,650m – 3,000m, the Mürren-Schilthorn ski region is the highest in the Bernese Oberland and gives you around 55km of pistes with top snow conditions well into the spring. Skiers and snowboarders can enjoy the I’m Rad snow park in Mürren and for non-skiers there are winter footpaths and toboggan runs. You can have a coffee whilst enjoying the view of 200 alpine summits in the rotating restaurant. The Mürren-Schilthorn area is fed by cable car from Lauterbrunnen and Stechelberg. Over the years we have managed to negotiate some superb equipment at excellent rates and have passed the benefits of this directly to you. We use one of the top Sports Shops in Grindelwald, Bernet Sports. We can offer you a huge 20% discount if you need to rent any equipment for your holiday.